hmahan_0529@yahoo.com is my email if you need to contact me directly! Welcome! 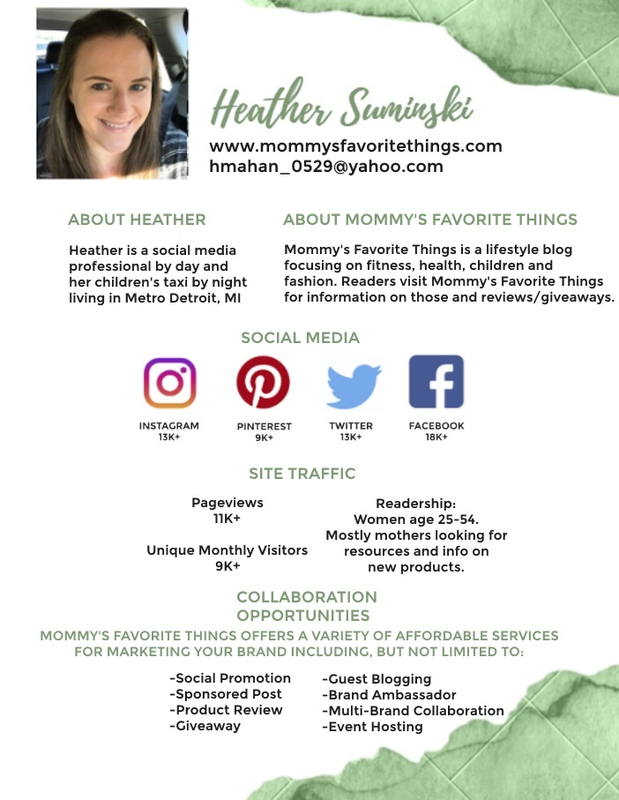 My name is Heather and I am the writer here at Mommy's Favorite Things. I started this blog in January 2009 as a way to earn extra entries in other giveaways I was entering. However, it has grown into so much more than that in those 9 years. I started blogging more about my life and then started hosting my own blog reviews and giveaways in September 2009. My blog has grown so much in the past 9 years and I am thrilled with it's success to date. My blog is Mommy's Favorite Things because I have three wonderful children. My children are my Favorite Things, but the products I review are as well. It has a double meaning. Avery is 10, Emerson is 6 and Liam is 4. This blog is mainly for reviews and giveaways but I do write a little about my life as well. I'm a SAHM so I have a LOT of say most of the time. And it's also here for me to write about my endeavors with different things, such as, cloth diapering, everything green and going green and much, much more. My readers range from men to women, mothers and father, aunts and uncles, grandparents, families and many in between. My blog is for everyone. I will review any item. I try and keep my blog children friendly, so I very RARELY write about "adult" items. I try and review more family oriented things. I will post the review within 4 weeks of receiving the product. I will not be responsible for shipping to me or paying for the product. I will use pictures from your website and will also take my own pictures in order to perform an accurate review. I may also use some info from your site as well. I have a minimum price point of $75 in product, I also charge a $50-$200 fee to facilitate reviews as well. I do require product AND compensation via PayPal to facilitate each review. If you're offering a giveaway as well I will not be responsible for shipping that item to the winner and the prize will be agreed upon prior to me posting. I will do a giveaway only (for a fee), but I much rather prefer to review the item myself as I want to be sure that what my readers are getting is a good product. I very rarely do a giveaway only. Same with reviews: I will use pictures from your website and will also take my own pictures in order to perform an accurate review. I may also use some info from your site as well.